We’d love your help. Let us know what’s wrong with this preview of The Blue by Lucy Clarke. Lana and her best friend Kitty leav In the tradition of Alex Garland’s The Beach, a spine-tingling adventure novel about a group of friends whose journey around the world on a yacht turns from a trip to paradise into a chilling nightmare when one of them disappears at sea. To ask other readers questions about The Blue, please sign up. This answer contains spoilers… (view spoiler)[ Yes! At some point Heinrich had mentioned that he was running out of money but then, after Lana left, he spent many more months on The Blue - that…more Yes! At some point Heinrich had mentioned that he was running out of money but then, after Lana left, he spent many more months on The Blue - that probably only worked because he stole Joseph’s money (even though he made up the excuse of a dead relative and their inheritance). I’d rank this book with The Secret History & The LIkeness as a gripping story of friendship, belonging, commitment - as well as deceit, deception & death. There is little you can experience to m When I hear CSN’s Southern Cross I always tear up. The Blue of the title of this book is a 50 ft. offshore sailing yacht. Had I the chance to join her crew when I was young, I’d have been off like a shot. Hell, I’d be already aboard even now if they’d have me. Even knowing how the voyage will end. I’d rank this book with The Secret History & The LIkeness as a gripping story of friendship, belonging, commitment - as well as deceit, deception & death. There is little you can experience to match crewing a sailing yacht offshore for sheer intensity & a sense of belonging. Aboard The Blue we have the skipper, Aaron, a thirty-some New Zealander & a pick-up crew of early twenty-somethings: Denny, another Kiwi, Heinrich a German ex-tennis pro, Joseph a French former diving champion, Shell a Canadian jewellery maker, & two English girls who are BFs, Kitty, an aspiring actress, & Lana, an artist. From Lana’s POV we get the story in two time frames, what happened aboard the yacht during a passage from the Philippines to Palau & Lana’s thoughts eight months later when she’s living in New Zealand & The Blue is posted missing. Aaron has a ‘no-relationships’ rule aboard the boat. That makes sense because everyone aboard already has a very high maintenance relationship with the yacht herself & in such a confined space there’s no room for hanky-panky & the rivalries & hurt feelings that would ensue. Not, as we might expect, that the rule won’t be flouted & with the girls being two BFs & a Lesbian, the mixture is pretty volatile. Then Joseph, who was supposed to have left the crew in the Philippines, is discovered as a stowaway when they're two days @ sea. During a night watch Joseph mysteriously disappears. As Lana was passed out from too much partying at the time, she doesn’t know what happened to him. Did he go over the side by accident, or was it suicide, or foul play? And what should Lana, & the rest of the crew, do? Lana’s initial response is that they should ‘inform “the Authorities”’ about Joseph when they reach Palau, & I am sure that many readers will think the same. But that is not what the skipper & the majority of the crew, including Kitty, decide. I put the expression ‘the Authorities’ in scare commas because it is so ambiguous - I wondered that none of characters, especially Aaron who is supposed to have been a barrister, ask Lana the question, ‘What ‘Authorities”?” There is no official record that Joseph was aboard The Blue. He vanished on the high seas whilst on passage to the tiny Republic of Palau. (I’d barely heard of it before.) Joseph was a citizen of France. The Blue was registered in New Zealand & her skipper a Kiwi. So presumably the ultimate ‘Authority’ determining the disposal of Joseph’s case would be a coroner’s court in Auckland whose only evidence would have been whatever the crew of the The Blue told them. The Blue would have impounded & probably lost to pay legal fees however the case turned out. I’d rank The Blue almost with The Likeness & The Secret History as contemporary tragedies. The setting, aboard a yacht on the high seas, is worthy of Conrad. But tho’ The Blue is clearly a five star (it disturbed my dreams last night - really) the characters, especially Lana, don’t quite achieve the level high tragedy requires. Given what we learn of his backstory, Aaron has the ingredients for truly tragic status, but we learn too little too late. (No, he does not resemble another classic sea-captain whose name begins with the same letter. But I would have had him as like Captain Lingard in Conrad’s The Rescue.) Lana seems to be another of those characters we keep encountering who are faced with a moral dilemma she hasn’t the education & ethos to know how to handle, who cannot distinguish between what’s legal & what’s right. Now that you’ve seen what a reviewer who thinks he does have those qualities would do, you might prefer to sail with a legalist like Lana. But for me in this particular case, what happens on the high seas should stay on the boat. The Blue was a beautifully addictive novel, the tale of a friendship put to the test and a tense psychological thriller with some really great characters. Lana and Kitty have been friends since childhood - both looking to escape home for different reasons, they set off on the trip of a lifetime. When they meet the crew of "The Blue" they slip into what seems on the surface to be an idyllic and easy going lifestyle sailing from place to place. But underlying tensions and secrets threaten the very The Blue was a beautifully addictive novel, the tale of a friendship put to the test and a tense psychological thriller with some really great characters. Lana and Kitty have been friends since childhood - both looking to escape home for different reasons, they set off on the trip of a lifetime. When they meet the crew of "The Blue" they slip into what seems on the surface to be an idyllic and easy going lifestyle sailing from place to place. But underlying tensions and secrets threaten the very fabric of their friendship - then tragedy strikes. The Blue is perfect summer reading, the setting is fascinating and well described and the group dynamic that Lucy Clarke develops is utterly engaging. By virtue of flashback we see how Lana and Kitty came to be, and came to be here, and start learning about events aboard The Blue that lead Lana to leave. The story has a wonderful flow to it, you will really get caught up in the lives of this small eclectic group of people - the author walks the line between tense mystery and captivating character drama really well, blending in the background perfectly to create an outstanding read that will grip you from first page to last. Overall then, a really great escapist read - I've had "A Single Breath" sat on my shelf for a while now, one of those books that fell accidentally into my basket on one particular shopping spree - and boy am I now moving that one up the pile. “The Blue” is Lucy Clarke's third novel, but the first novel I have read by this author. In “The Blue”, the author writes about the power of friendship, when faced with many obstacles. The major relationship in this story is between Lana and her best friend Kitty. This novel is a mystery thriller that has it all; romance, mystery, adventure and intrigue. 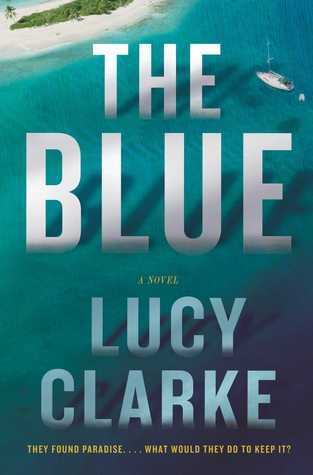 Wish I was on a Yacht…sailing off yonder to some undisclosed location…with the beating sun on my body, and the cold refreshing aqua water swirli “The Blue” is Lucy Clarke's third novel, but the first novel I have read by this author. In “The Blue”, the author writes about the power of friendship, when faced with many obstacles. The major relationship in this story is between Lana and her best friend Kitty. This novel is a mystery thriller that has it all; romance, mystery, adventure and intrigue. Wish I was on a Yacht…sailing off yonder to some undisclosed location…with the beating sun on my body, and the cold refreshing aqua water swirling at my feet. Nice to dream! When one of their friends disappears overboard…everything starts to unravel. Lana and Kitty, best friends from childhood escape their boring lives in England to backpack in Asia. 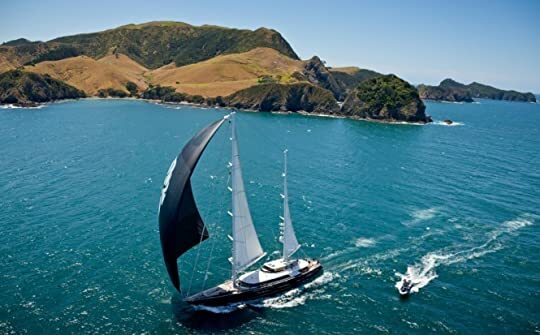 In the Philippines they are invited to join the crew of The Blue, a beautiful yacht sailing on a voyage beginning in the Philippines ending in New Zealand, expected to take as long as 8 months. The two women accepted the offer, and instantly fell in love with this new way of life. They spent their days exploring new islands, swimming, snorkelling and sunbathing. This novel is written in two threads – “Then” and “Now”, and each chapter is devoted to unfolding the events of the trip, told through Lana’s POV. But the tension gradually builds and the reader sees that this is not the “perfect life”. Dark events, buried secrets, lies and deceit, leads to disaster for the yacht and its crew. No one knows who to trust. Unexpected twists and turns will have you guessing to the end. Switching from the “Then” and “Now”, allows the novel to unfold at a steady pace, while allowing for in-depth character development. The seven characters in this book were very believable and all well developed. Everyone appears to be keeping a secret and no one is truthful about why they've come to The Blue. Who can you trust? The story is told mostly through Lana's point of view after she leaves the yacht, switching between the present, and her time on the yacht. I was drawn into the story because I had to know why Lana left the yacht, and left Kitty behind. Many thanks to the author, Lucy Clarke, the publisher, Touchstone and Netgalley for the ARC of “The Blue”, in exchange for an honest review. Much appreciated. Lana and Kitty, best friends from childhood escape the doldrums of their lives in England to backpack in Asia. In the Philippines they are invited to join the crew of The Blue, a beautiful yacht sailing lazily through the Pacific islands. The girls are quickly seduced by the magic of the lifestyle; sailing from one beautiful island to the next, lazing on pristine beaches, diving on coral reefs, dining on fresh fish and exotic fruit and relaxing on deck drinking with new found friends. Life doesn't get any better than this but all the time you can feel the hint of something sinister lurking in the background. When something does go wrong, not only is their idyllic lifestyle but also their friendship threatened. This is a gripping, addictive story. Written in two threads - Then and Now, events slowly unfold from the early wonder of the trip and the perfect life on board the yacht to the deeper, darker events that eventually lead to disaster for the yacht and its occupants. Long held secrets emerge, lies are told and friends betrayed until no one knows who to trust. The characters are complex and individual and their interactions with each other real. The tension builds slowly in this very atmospheric novel like a tropical storm getting ready to suddenly let loose. Even as you think you know what has happened, there are unexpected twists and revelations that have you guessing to the end. Highly recommended to all lovers of mysteries and thrillers! The Blue is Lucy Clarke's third novel, following The Sea Sisters (known by the more elegant title Swimming at Night in the US) and A Single Breath. The stories are not officially connected, but might be considered a loose trilogy: they each have the tone of a thriller, but with softer edges; a big focus on secrets (usually someone lying about their past); a bit of a love story somewhere in the background; but most prominently and memorably, they Review originally published at Learn This Phrase. The Blue is Lucy Clarke's third novel, following The Sea Sisters (known by the more elegant title Swimming at Night in the US) and A Single Breath. The stories are not officially connected, but might be considered a loose trilogy: they each have the tone of a thriller, but with softer edges; a big focus on secrets (usually someone lying about their past); a bit of a love story somewhere in the background; but most prominently and memorably, they demonstrate a romantic attachment to the idea of wanderlust and to an impossibly picturesque ideal of travelling, with colourful, richly described locations featuring just as significantly in the story as the characters. Even A Single Breath, which wasn't explicitly about travelling per se, involved a journey to a far-flung place and a lot of scenic description. While The Sea Sisters was about siblings and A Single Breath about a newly married couple, in The Blue, Clarke turns her attention to a friendship. The major relationship in this story is between Lana and her best (in fact, only) friend Kitty. They have known each other since the first year of high school, where Lana was the archetypal artistic misfit and Kitty her social lifeboat - the two of them bonded over the loss of their mothers at a young age. Flashbacks to various key points in this friendship are what anchor the story and give their characters some solidity. Lana and Kitty - the former escaping from a murkily difficult relationship with her father, the latter from a failing acting career and nascent alcoholism - pool their savings, pick a location (the Philippines) at random, and set off travelling. This is more or less where the beginning of the story finds them: Lana falls in the street, a man stops to help, and then they meet his friends, the crew of a yacht named The Blue. The two women instantly fall in love with the group's romantic, semi-nomadic way of life - everyone pays what they can towards the upkeep of the yacht, and decisions are made democratically; their days are spent travelling around virtually undiscovered islands, swimming, snorkelling and sunbathing - and, in the quick and convenient way of events in books, they move into an empty cabin. But it's not long before it becomes evident that things aren't quite as idyllic as they seem aboard The Blue. With seven people living in close quarters on a cramped ship (and relationships between them ostensibly forbidden), tempers swiftly fray and cracks appear in Lana and Kitty's new 'perfect life'. “The Blue” was not my first introduction to Lucy Clarke. In fact, I had the pleasure of being able to read “A Single Breath” not that long ago. Both “Blue” and “Breath” clearly illustrate the author’s obvious love for the water and all things oceanic. In “The Blue”, two young women from England, Kitty and Lana, leave their homes and their lives behind and choose to travel with a group of like-minded young adults, aboard a yacht called The Blue. While on their journey, relationships are formed, a “The Blue” was not my first introduction to Lucy Clarke. In fact, I had the pleasure of being able to read “A Single Breath” not that long ago. Both “Blue” and “Breath” clearly illustrate the author’s obvious love for the water and all things oceanic. In “The Blue”, two young women from England, Kitty and Lana, leave their homes and their lives behind and choose to travel with a group of like-minded young adults, aboard a yacht called The Blue. While on their journey, relationships are formed, adventures are experienced and memories are made. However, when something tragic happens aboard the ship, Lana is forced to make tough decisions that may jeopardize her relationship and her status on The Blue. Years later, tragedy strikes the group again and it is up to Lana and her friends to decide whether to reveal the secrets that have been hidden for years. Clarke has a way with words. Besides being creative and enchanting, she has a way of making her readers want more. Her books are not overly long, but each page is filled with drama and suspense, and this makes a reader relish every word to try and prolong the experience. Clarke’s characters, especially Kitty and Lana, are so very different and yet so very flawed that they were able to both evoke my sympathy and my anger, sometimes both emotions simultaneously in the short span of a few chapters. “The Blue” has the ideal setting as well; the idea of living a fantastical life on the sea, traveling from beautiful island to beautiful island, seeing sights and living with nothing but the sounds of the ocean. With this as a background, Clarke is able to draw a reader in, and then keep my interest with her tales of romance and suspense. This is the perfect “who-dunnit?” for a day at the beach or a cozy night under the covers. Damn that was good! My stomach is in knots! I've found a new favorite author and as soon as I finished this one, I bought one of her other books, Swimming at Night. I hope it's just as good! And unfortunately the book ended too! : ( which I'm hating right now because it really was that good! If I had to compare it, off-the-top of my head I would say it's 'somewhat' similar to The Woman In Cabin 10 but I think The Blue- characters, plot, everything is a thousand times better. If you enjoy nautical themed novels, then you seriously don't want to miss this one! It's a perfect summer read! Found this slower in some spots than others but all is revealed at the end with a few surprises. Will definitely read more by this author. A good escapist read and perfect for the summer. 3.5. Best friends Lana and Kitty leave their homes and begin travel to the Philippines. While in the Philippines, the have some extraordinary luck. Lana and Kitty befriend the young crew of a yacht named The Blue. For a small fee each month and an agreement to follow certain rules, they join the crew to wander the world. I was pulled into this book immediately. I could feel tension and suspense from the beginning. Things begin to happen on board The Blue, and it seems as though everyone on board has Best friends Lana and Kitty leave their homes and begin travel to the Philippines. While in the Philippines, the have some extraordinary luck. Lana and Kitty befriend the young crew of a yacht named The Blue. For a small fee each month and an agreement to follow certain rules, they join the crew to wander the world. I was pulled into this book immediately. I could feel tension and suspense from the beginning. Things begin to happen on board The Blue, and it seems as though everyone on board has secrets. A riveting read! Dieses Buch hat mich wirklich überrascht, eigentlich hat mir das Cover sogut gefallen und ich dachte, leichte Frauenlektüre für den Sommer mitzunehmen. Da ist aber viel mehr darin und es hat mich von Anfang an gefesselt über die "Blue" und ihre Mannschaft zu lesen. Firstly, I would like to thank Simon & Schuster Canada for providing me with an Advance Reader’s Copy of The Blue by Lucy Clarke as well as photos that were taken by Lucy herself while she was doing some research for the novel. Psychological thrillers are one of my favourite genres to read and when I was offered an ARC of The Blue and reading its synopsis, I was more than excited to read and review it. As I had never heard of The Blue or Lucy Clarke previously, I went into The Blue blindly in hopes that I would enjoy the ride, and I definitely did. I love when a story travels between two timelines, especially within a psychological thriller because it gives that sense of before and after. I really enjoyed the aspect of flipping back and forth between the "before" with Lana & Kitty’s experience on the yacht and the "after" with Lana now living in New Zealand while trying to figure out the events that took place to make Lana decide to leave the utopian lifestyle. Almost every chapter left you with the sense of needing to continue reading in order to figure out what was going on. There were definitely a fair amount of twists and cliffhangers throughout the entire novel that kept me entertained and making guesses. None of them were extremely mind blowing, but they were enough to keep me intrigued. A spellbinding novel of the vastness of the ocean, a sailing expedition of a seven member crew on a 50 ft. yacht "The Blue" authored by Lucy Clarke. On an extended holiday from England, Lana and her lifelong best friend Kitty were enjoying the tropics in the Philippines. Lana, upset with her father, was facing profound disappointment. Kitty's acting career never reached the success she had hoped for. Both women were looking for adventure as they attempted to avoid their troubles. Intrigued and im A spellbinding novel of the vastness of the ocean, a sailing expedition of a seven member crew on a 50 ft. yacht "The Blue" authored by Lucy Clarke. On an extended holiday from England, Lana and her lifelong best friend Kitty were enjoying the tropics in the Philippines. Lana, upset with her father, was facing profound disappointment. Kitty's acting career never reached the success she had hoped for. Both women were looking for adventure as they attempted to avoid their troubles. Intrigued and impressed when they became acquainted with the crew of The Blue and visited the yacht, Lana and Kitty eagerly accepted the offer to join the fun loving crew. The voyage beginning in the Philippines would end in New Zealand, and take as long as 8 months, depending on the weather and daily covered nautical miles. The wise experienced Skipper of The Blue, Aaron was a thoughtful and reserved man. Although all decisions were voted on by the crew, Aaron expected to maintain a reasonable order, his authority was followed without question. Relationships among crew members were forbidden to avoid strife and confusion. Lana and Denny attempted to honor all the rules and hid the desire and chemistry between them. When Lana and Denny went snorkeling before setting sail, someone was following and watching them. This was unnerving, Denny did not want to reveal his attraction of Lana to Aaron, as Lana wondered who was following them and why, she discussed the strange situation with Kitty. It was necessary to sail before March 15th, Lana attempted to understand why so much seemingly important information wasn't shared openly among the crew. After the expedition began, the yacht was constantly monitored, crewmembers participating in a 24 hour rotating watch. After a week at sea, the crew had been drinking (spiked drinks) late into the night. The crew discovered a missing member the next day, no one knew what happened to him or why. While it was true the missing man was on the yacht under shady circumstances he didn't deserve to go overboard (March 15th). Was this a possible suicide? The man was obviously troubled. Aaron had a prior volatile disagreement with him, there was some blood on the deck, yet no one witnessed what happened.. or, if they did, weren't saying. The grueling spotlight search through the water was unsuccessful, as Lana discovered clues in the missing man's notebooks. Lana also began to feel fear when Aaron suggested the yacht would be impounded for an unknown amount of time if the situation was investigated, their expedition would end. The crew was in shock and distraught over the tragedy, yet the majority voted not to report the incident to port authorities. The story is narrated by Lana alternating between "then" and "now" as she recalled both past and current events that occurred before and after The Blue reportedly sank. Each crewmember understandably had their own private life stories, and some were more reluctant to share details then others. The Blue allowed crew members to escape the more unpleasant and mundane realities of life on land, in Lana's case she sought temporary escape from paternal betrayal. The sailing adventure connected these seven individuals in unforgettable intrigue, mystery that explored how fast and instant are changes from the human condition combined with the natural elements that forever impact a person's life. I've been intending to try Lucy Clarke, and I'm so glad I finally did! The Blue was a fascinating book, very original, and filled with suspense. It was not at all your typical thriller, but was still very mysterious. It had a great cast of characters, a captivating storyline, a very unique setting, and an interesting way of going back and forth in time between the two storylines that happen several months apart. Friends Lana and Kitty are on a trip when they are invited to join the crew of a yach I've been intending to try Lucy Clarke, and I'm so glad I finally did! The Blue was a fascinating book, very original, and filled with suspense. It was not at all your typical thriller, but was still very mysterious. It had a great cast of characters, a captivating storyline, a very unique setting, and an interesting way of going back and forth in time between the two storylines that happen several months apart. Friends Lana and Kitty are on a trip when they are invited to join the crew of a yacht in the Philippines. At first they have a wonderful time relaxing, crewing the yacht, and exploring various islands. Before long, this paradise starts to come apart. It is clear that some of the crew members are keeping secrets, and before long one of them is lost at sea. There is dissension among the group over whether to report the drowning, and some of the relationships rip apart, including the friendship of Lana and Kitty. Months later, a tragedy has befallen the yacht and Lana goes to the rescue headquarters to be there when any survivors are brought in and to finally try to puzzle out the secrets of those who were onboard the yacht. This book had so many twists that I couldn't put it down. Every time I was going to stop reading for the night something huge would happen and I would NEED to keep reading! The very last twist had my jaw hitting the floor. I couldn't believe what I had just read! I was absolutely stunned! This was a perfect read for the summer with all the descriptions of tropical paradises and life on the yacht. It was so idyllic that I completely understand why the crew were so desperate to keep their amazing This book had so many twists that I couldn't put it down. Every time I was going to stop reading for the night something huge would happen and I would NEED to keep reading! The very last twist had my jaw hitting the floor. I couldn't believe what I had just read! I was absolutely stunned! This was a perfect read for the summer with all the descriptions of tropical paradises and life on the yacht. It was so idyllic that I completely understand why the crew were so desperate to keep their amazing lifestyle. I would love have been on The Blue too! The dual timelines were really effective at drawing me into the mysteries and let me become quite attached to some of the crew. Knowing that something awful was coming just ratcheted up the tension as I feared for my favorite characters. Right until the very end it wasn't clear what had happened and who would survive. I finished this book and my first thought was to immediately pass it on to my best friend. You know a book is good when you need to share it right away! I'm going to hunt down all Lucy Clarke's previous novels. A lazy Sunday afternoon + this book = an enjoyable way to pass the time. What I think the author does really well is to really keep her reader guessing. I like to try and outsmart characters in books by working out what is going on before they do. I didn't manage it with this one. I was surprised, genuinely surprised, by the final revelation, though I had worked out the rest of what was going on. The author had given some clues about that thing though, I just hadn't put them together. So well pla A lazy Sunday afternoon + this book = an enjoyable way to pass the time. What I think the author does really well is to really keep her reader guessing. I like to try and outsmart characters in books by working out what is going on before they do. I didn't manage it with this one. I was surprised, genuinely surprised, by the final revelation, though I had worked out the rest of what was going on. The author had given some clues about that thing though, I just hadn't put them together. So well played Lucy Clarke, well played. Ein typisched Buch von Lucy Clarke, dass ich mit viel Spannung gelesen habe. Es ist eine wundervolle Geschichte über eine Seefahrt, die aber plötzlich sehr dramatish wird. Der Epilog hätte meiner Meinung nach gestrichen werden können, da es denn Leser das Ende zerstört. I am having a hard time deciding what to say and how to rate this book. I had a difficult time reading it and yet the story itself had so much potential. The ending was good, but it was a long time getting there. This one is between a 2 and a 3 star read, and I gave it two because for so much of the book I really wasn't enjoying reading it. 1. The setting of the story had the potential to draw one in. The feeling of sailing the ocean, the freedom from the normal grind of life, the p I am having a hard time deciding what to say and how to rate this book. I had a difficult time reading it and yet the story itself had so much potential. The ending was good, but it was a long time getting there. This one is between a 2 and a 3 star read, and I gave it two because for so much of the book I really wasn't enjoying reading it. 1. The setting of the story had the potential to draw one in. The feeling of sailing the ocean, the freedom from the normal grind of life, the pull of the deep blue sea. The perfect setting for an adventurous life and the tragedy that occurred on a boat called The Blue. 2. An interesting group of people each with their own reason to walk away from where they were and sail on The Blue. The relationships that develop between the crew was interesting. 3. The mystery of what happened on board The Blue and the secrets that everyone kept. (Although the secrets also became a negative as I found them an impediment to character development.) The relationships and demeanor of the crew change from lighthearted and fun to one with a darker, more secretive and sinister undercurrent. 1. This is written from the perspective of Lana which limits the story and skews what you see as it based on what she sees. 2. A large portion of the story is written in present tense and saying I'm not a fan a present tense is an understatement. There is a reason the experts say to stick to past tense. For me the large section written in present tense was an obstacle to get over. In addition, different parts of the story are written in past tense so as you read you jump tenses depending on time frames. It creates a very choppy read and an even bigger reading obstacle. I almost quit reading a number of times simply on this alone. 3. In addition to changes in tense, the story jumps between "Then" and "Now". "Then" is Lana's time on The Blue. Now is her time after leaving The Blue and hearing that the boat sunk and it's crew is lost at sea with Search and Rescue looking for them. She also has memories of her time before sailing on "The Blue" and why she is estranged from her father. For me the entire book was very choppy and I had a difficult time sticking with it and found myself skipping over some sections. 4. As this was written from Lana's perspective most of the characters aren't developed and fleshed out as well as I would have liked. I understand why the author chose to reveal her story this way; it just didn't really work for me. 5. The characters weren't very likable and that includes Lana. It was hard to be vested in them. You only got brief interactions with the other crew members and generally not in a positive way. It made it hard to care about what happened to them. 6. The story was very slow to reveal itself and although the ending was good I'm not sure it was worth the effort. Conclusion: At the end of the day, should the book be an interesting plot or should it be an enjoyable read? I think it should be both and for me although the plot was interesting and at points really sucked me in, I didn't find the characters likable or the writing enjoyable. Lucy Clarkes neues Werk „Das Haus, das in den Wellen verschwand“ konnte ich kaum abwarten, nachdem mich die Autorin vergangenes Jahr mir “Der Sommer, in dem es zu schneien begann“ so überzeugt hat. Und auch diesmal ließ sie mich nicht enttäuscht zurück. Zum Inhalt selber will ich gar nicht weiter viel sagen, da nicht nur die Spoilergefahr zu hoch wäre, sondern ich auch der Meinung bin, dass jeder diese Geschichte für sich selbst entdecken sollte. Lucy Clarke hat hier sehr interessante, aber auch genauso verschiedene Charaktere geschaffen. Die Gruppendynamik zwischen den sieben Crewmitgliedern ist dennoch erstaunlich faszinierend. Alle haben einen Grund, ihr altes Leben hinter sich zu lassen, alle brauchen sie die Blue. Die Beweggründe jedes Einzelnen sich auf dieses Abenteuer zu begeben, sind dabei ganz verschieden und kommen im Verlauf Stück für Stück ans Licht. Das Leben auf der Blue selbst wirkte wie ein Paradies, was die Autorin durch bildhafte Beschreibungen geschaffen hat. Es war, als reiste man selbst auf der Blue mit, verweilt auf den wunderschönsten Inseln, liegt an den traumhaftesten Stränden und erkundet die unglaublichsten Buchten. Ein dramatisches Ereignis zerstörte jedoch alles. Jeder hat plötzlich etwas zu verbergen und jeder scheint etwas über diese eine verhängnisvolle Nacht zu wissen, nur Lana nicht. Aus Spaß und Freiheit wird Verrat und Misstrauen. Lana selbst war mir dabei immer sympathisch. Gelegentlich war sie etwas zu direkt und kannte ihre Grenzen nicht, aber genauso wie sie, wollte auch ich nur die Wahrheit wissen. Erzählt wird die Geschichte aus der Sicht von Lana auf zwei Zeitebenen. Einmal erlebt man das „Jetzt“, in dem Lana bereits von Board der Blue gegangen ist und in dem ein schreckliches Unglück sie und die Ereignisse auf der Blue wieder einzuholen droht. In „Damals“ erfährt man, wie Lana und Kitty auf der Jacht gelandet sind, wie sie die Zeit dort verbracht haben und welche wunderbaren aber auch unschönen Dinge dort geschehen sind. Dabei kann man sich sehr gut in die Gefühle von Lana hineinversetzen. Lucy Clarke hat einen einnehmenden, aber dennoch leichten Schreibstil, in dem man mühelos versinken kann. Spannung wird durch die Geheimnisse und den Ereignissen auf der Blue immer mehr aufgebaut. Manchmal ahnt man sowohl im Damals auch im Jetzt, worauf es in etwa hinausläuft, manchmal hat die Autorin aber auch Überraschungen parat, sodass sich ein perfektes Gleichgewicht ergibt. Lana and Kitty have been best friends since childhood and now that they are adults, they escape England to travel the world after Lana received some devastating news. They spun the globe and picked a spot: The Philippines. While there they come across a group of young adults who travel the world aboard their yacht, The Blue. It seems like an idyllic way to live, sailing around to exotic locations without a care in the world. After hanging out with them, the crew votes to decide if Lana and Kitty Lana and Kitty have been best friends since childhood and now that they are adults, they escape England to travel the world after Lana received some devastating news. They spun the globe and picked a spot: The Philippines. While there they come across a group of young adults who travel the world aboard their yacht, The Blue. It seems like an idyllic way to live, sailing around to exotic locations without a care in the world. After hanging out with them, the crew votes to decide if Lana and Kitty can join The Blue's crew and after the group's consensus, they were invited on board. Aaron, the captain, has some strict rules though, such as no one on board can have a romance with another crew member, they all must share duties, and pay equal amounts of money as living aboard a yacht isn't cheap. As Kitty and Lana get to know the other people on board, they realize that they are truly living a dream. Lana even hits it off with Denny and she secretly sees him since it's against the rules to have a romance on board. As more time passes, things start to unravel though. A crew member disappears and Lana wants answers. The more she pokes around, the more flack she gets from Aaron, but she can't help how she feels. She knows he is hiding a secret. Lucy Clarke's The Blue has all the ingredients for a fantastic beach read. There are faraway locations, a gorgeous yacht, a romance and a thrilling mystery. When I first read the synopsis for this book I thought it sounded amazing and I couldn't wait to slip between its pages... But the reality was, I was left disappointed. Lana is the narrator of this tale, but she tells it from 2 different time periods, Then, Now, with a little bit of before when her and Kitty were just girls thrown in. This constant back and forth is one of the problems I had with this story, while many may enjoy the mystery it weaves, I felt like we never really got a chance to When I first read the synopsis for this book I thought it sounded amazing and I couldn't wait to slip between its pages... But the reality was, I was left disappointed. Lana is the narrator of this tale, but she tells it from 2 different time periods, Then, Now, with a little bit of before when her and Kitty were just girls thrown in. This constant back and forth is one of the problems I had with this story, while many may enjoy the mystery it weaves, I felt like we never really got a chance to know anyone, all of our feelings for characters where clouded by Lana's feelings after leaving The Blue. And yes considering how the story plays out this is very cleverly done by Clarke, but for me it was a bit of a sticking point. Because of the constant switching from Then and Now we only get glimpses of the story, of what really happened , and for me the story unfolded just too slowly. On more than one occasion I almost put the book down and walked away. To be honest it was sheer determination to find out who was responsible for what that made me stick with it. Another terrific book from Lucy Clarke! I loved this book (as I have her two previous books, Swimming at Night and A Single Breath)! This is a story that goes back and forth (in a good way) between "now" and "then" and goes on to tell what happens to a group of people who set off on a yacht called The Blue. The locations, where most of the action on The Blue takes place, are so beautifully described that I felt as if I were there and sailing along on the yacht! My favorite line in the book is : " Another terrific book from Lucy Clarke! I loved this book (as I have her two previous books, Swimming at Night and A Single Breath)! This is a story that goes back and forth (in a good way) between "now" and "then" and goes on to tell what happens to a group of people who set off on a yacht called The Blue. The locations, where most of the action on The Blue takes place, are so beautifully described that I felt as if I were there and sailing along on the yacht! My favorite line in the book is : " The Blue is a mindset. A place within yourself"....that's how I felt reading this book! I needed to get back to that mindset!! Beautifully written characters and some great twists and turns....and there it is...another fun, fabulous, summer read! I would highly recommend this! A group of young adults find themselves in paradise as they abandon land based responsibilities and ambitions to sail wherever aboard the beautiful yacht, The Blue. Initially, this existence is idyllic, swimming, snorkeling, sun bathing, until something goes terribly wrong, causing catastrophic dissension. Loyalties become tenuous, jealousies surface and tempers flare. It is a well told tale, with lots of suspense, twists, and definitely a dark side! A satisfying page turner!